S and I went out on Friday for her birthday. It was sort of a last-minute thing, so we headed someplace close and with several restaurants in the vicinity, just in case we got shut out of one. 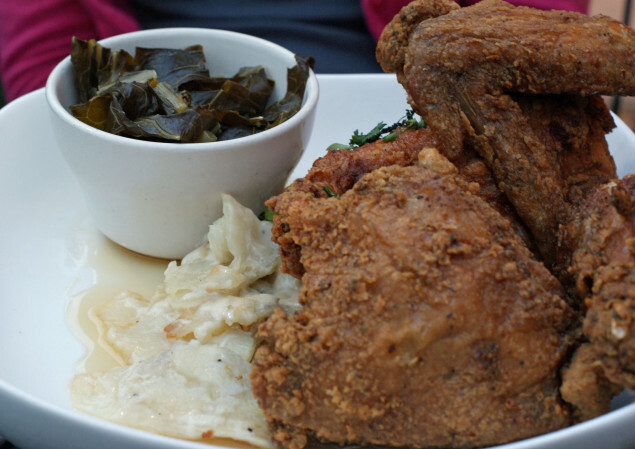 We did not, and ended up at Zanzibar, a nice spot on Shaker Square specializing in soul and Southern cuisine. Being a Friday, the place was pretty packed and we had no reservations, but there was seating outside, which we took. It was a pleasant, warm evening… for about the first ten minutes. Until a sudden gust of wind knocked one of the umbrellas onto the people sitting at the table next to us. That must have been the leading edge of the cold front, because over the course of our meal, the temperature must have dropped a good 15 degrees. Such is weather in northeast Ohio. As far as the food goes, it was good, but nothing spectacular. 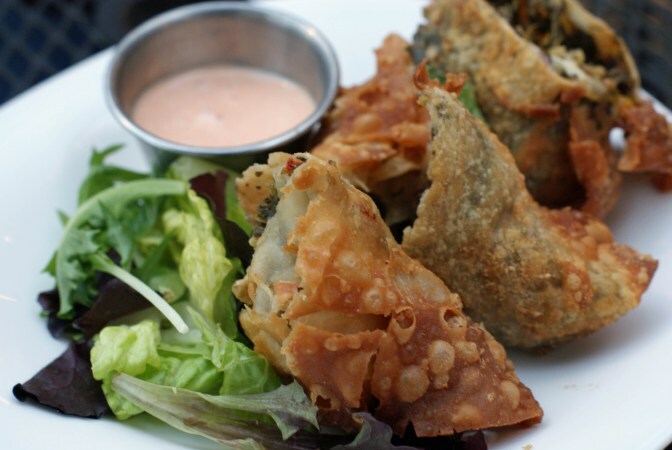 We started with Soul Rolls, which are a take on egg rolls, stuffed with chicken, greens, black beans and roasted corn, with a spicy remoulade sauce on the side. These were very good, and the sauce added a nice kick. S opted for the honey-glazed fried chicken, with house potato (sliced thin in a creamy sauce) and collard greens. 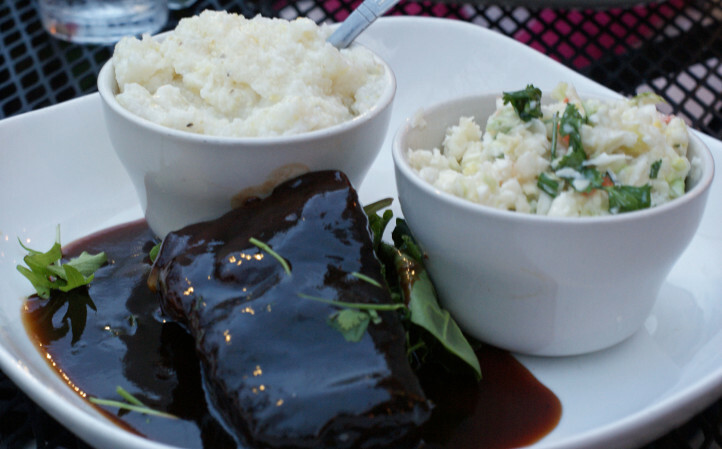 I tried the BBQ beef shank (smothered in a watermelon barbecue sauce), along with cole slaw and grits. We noted that they’re not really much for presentation (which may be intentional; I don’t think they’re really going for fancy) – our plates consisted of the meat, with the sides in a couple small crocks on the plate. The meats were both excellent – the chicken had a pleasant sweetness and was nicely moist, and the beef was tender, with the watermelon adding enjoyable flavor to the sauce. We were a little disappointed with the sides, as they seemed to be a bit lacking. The potatoes were excellent, but there weren’t many on the plate. The slaw was good as well, but save for the addition of some cilantro, not really distinguishable from any other cole slaw. The greens could have used a little more depth of flavor, and the grits needed some more salt, which is saying something for me, since I usually need very little. It was all good, just not up to the level we expected from a restaurant of this caliber. Final verdict: Zanzibar gets five out of seven stars. The food was good, but most of it was not great. The prices are quite low, with most entrees topping out at less than $15. And, of course, the service was great, even though they couldn’t come up with any other seating. And while we’re on that topic, the weather gets a big fat zero for this outing.